I hate homework, but I love Homework, the infinitely customizable table that you set up yourself in any way that fits you. Definitely veehee smart, and definitely veehee pretty. And I so like smart and pretty. In a table too. 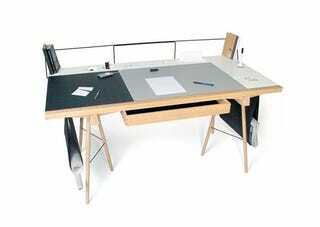 According to the designer Robin Grasby, Homework "allows the user to customize every aspect of their workplace. By selecting everything, from surface size and materials to storage and accessories, the user can create an environment as rich and specifically personalized, or as simple and generic as they require."